PHOENIX — KidsCare returned to Arizona on Tuesday after a more than five-year absence and advocates expect to sign up more than 30,000 children for access to free or affordable medical, dental and vision care by the end of the year. “Insurance is more than just a card, it really represents having access to care,” said Swapna Reddy, a professor on health disparities at Arizona State University. Blanca Muñoz knows that firsthand. More than five years ago she got a letter in the mail saying the KidsCare coverage for her three children was being dropped. “I didn’t understand the communication, because they didn’t speak to me. I thought it was a mistake,” Muñoz said in Spanish. Muñoz’s children bounced from program to program to find help, not always successfully. Her children did not visit a dentist once during that time. KidsCare is Arizona’s version of a federal health-insurance program for children and families who aren’t eligible for Medicaid or AHCCCS, Arizona’s affordable-health care program, or don’t have access to employer-sponsored health insurance. KidsCare is free or costs families a maximum of $70 per month. In 2010, the program covered more than 50,000 children, but the Arizona program ground to a halt after federal funding was cut. Arizona became the only state without a local version of the federal program for children. In 2015, Arizona ranked 40th for children covered by health insurance and not much better in terms of overall well-being of children, according to a KidsCount report. The Arizona program was reinstated by Gov. Doug Ducey in May after federal funding was restored, with advocates estimating more than 30,000 Arizona children are expected to be covered by KidsCare by the end of the year. 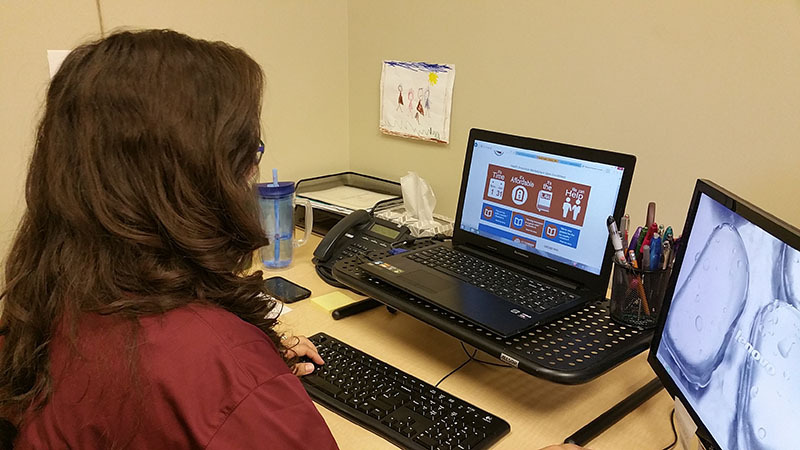 Health officials are promoting word-of-mouth measures and online tools to sign up. But getting people to sign up may be difficult given that many of those who don’t have access to affordable health care also can’t afford computers or smartphones. Keogh Health Connection, an advocacy organization, is trying to help. The organization primarily serves Hispanic families, including Spanish speakers. National data shows 52 percent of Hispanic children are covered by the federal program. Muñoz’s two oldest children are now 21 and 20 years old and no longer need KidsCare. But on Tuesday, she was at the Keogh center signing up her youngest daughter.